Moving Week is here! I say this with both exhilaration and trepidation. Part of me wants to sing and dance, and the other part wants to run away and hide until it’s all behind us. Ha ha. Simple dinners have full reign of my kitchen and time consuming ideas are beaten back with a stick. My luxury meal planning time is practically nonexistent. As I recently sat in the parking lot of the grocery store and scribbled down my weekly menu and grocery list, I closed my eyes and tried to think of something that would be very summery, full of fresh flavor and not take too much time. 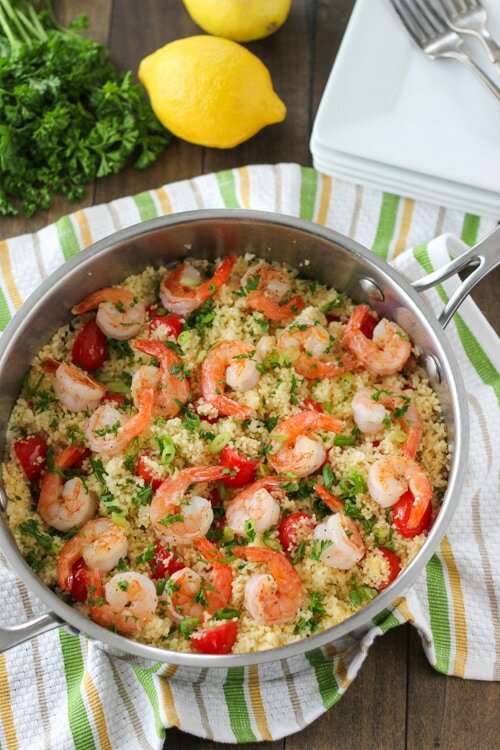 Shrimp and couscous came to mind immediately. Both ingredients scream SPEED to me. Each take 5 minutes to prepare, and it’s hard to find any other kind of full meal that can beat that record. 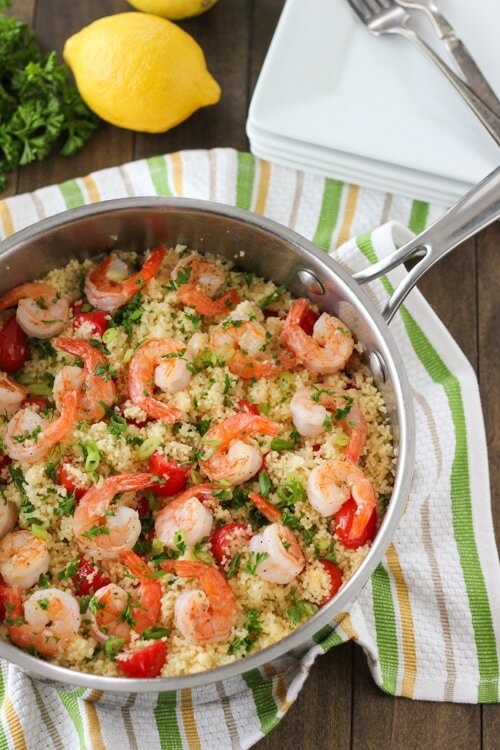 Put these juicy, plump shrimp with fluffy couscous on your menu. I think the addition of tomatoes, aromatics, fresh herbs and lemon juice really elevate this dish to an elegant and sophisticated meal, even though it’s technically easier to prepare than to take the time to get take out. Nobody said that delicious, homemade dinners that look 100% gourmet need to be difficult to make. I have to go back to my boxes, but I can’t wait to come back soon and show you our new place:). But before that happens, I need to stay sane for the rest of the week, get all our possessions packed up and transported, all while entertaining a very rambunctious child and an attention hungry baby. Heat 1 Tablespoon of oil in a deep skillet. Add the onion and jalapeño. Season with salt and pepper. 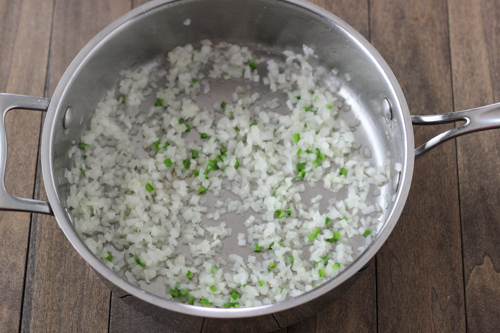 Cook for about 5 minutes, on medium heat, until the onions are softened. 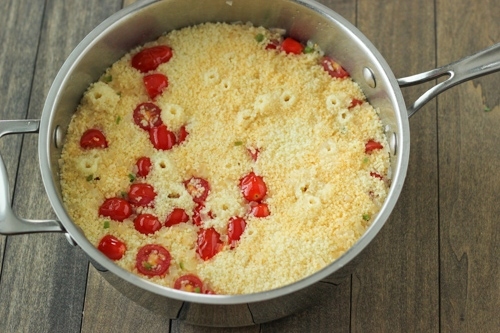 Increase the heat to high, add the tomatoes and cook for another 2-3 minutes. Add the garlic and cook for 3o seconds. 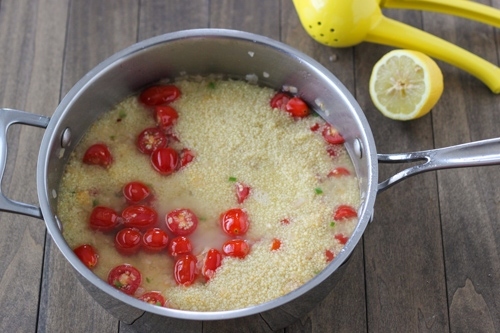 Add the couscous to the skillet and pour in the broth and 1-2 Tablespoons of lemon juice. Bring it to a boil, turn off the heat and let it stand, covered for 5 minutes. 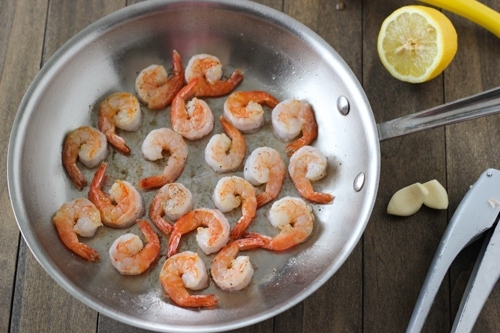 Meanwhile, add 1 Tablespoon of oil to another skillet and sear the shrimp for 1-2 minutes per side, on high heat, seasoned with salt and pepper. Cook half of the shrimp at a time. 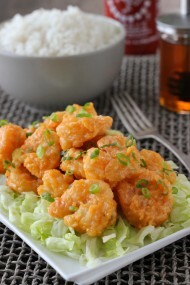 When you turn the shrimp over, add 1 clove of minced garlic and another 1 Tablespoon of lemon juice to the skillet. Repeat with the second half of the shrimp, lemon juice and garlic. Add parsley after you turn the heat off. Fluff the cooked couscous with a fork. Add the shrimp to the couscous and serve. 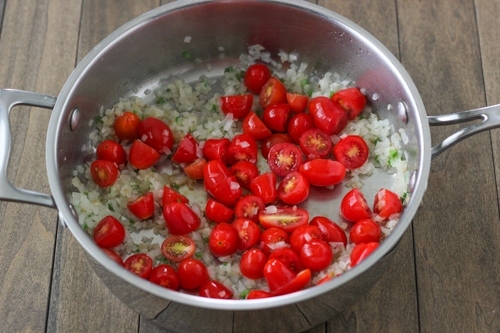 increase the heat to high, add the tomatoes and cook for another 2-3 minutes. Add the garlic and cook for 30 seconds. 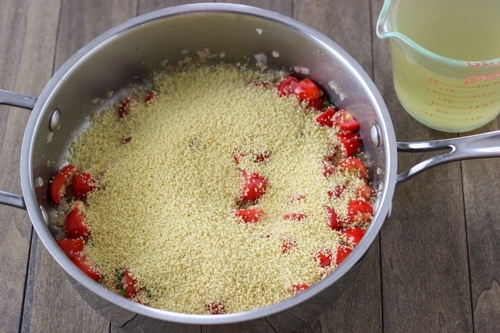 Add the couscous to the skillet and pour in the broth and 1-2 Tablespoons of lemon juice. Bring it to a boil, turn off the heat and let it stand, covered for 5 minutes. 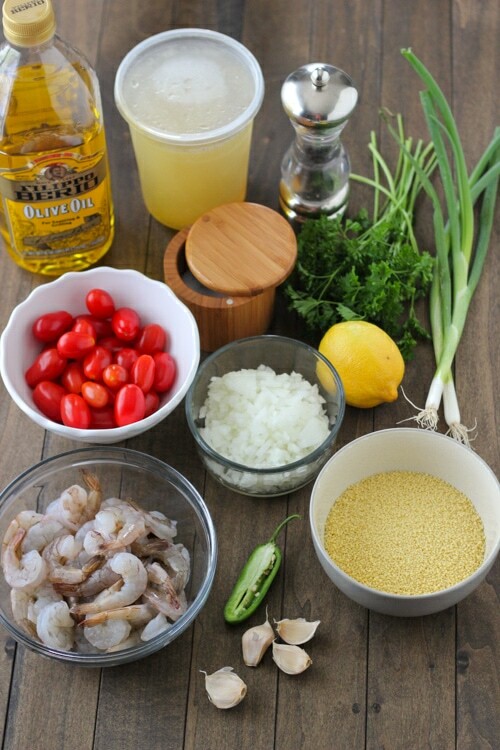 Meanwhile, add 1 Tablespoon of oil to another skillet and sear the shrimp for 1-2 minutes per side, on high heat, seasoned with salt and pepper. Cook half of the shrimp at a time. 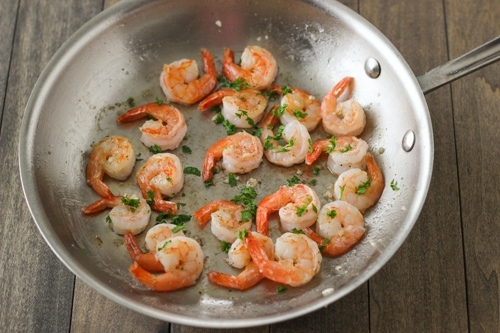 When you turn the shrimp over, add 1 clove of minced garlic and another 1 Tablespoon of lemon juice to the skillet. 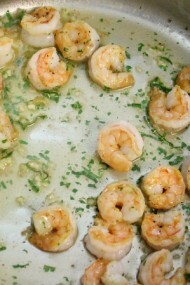 Repeat with the second half of the shrimp, lemon juice and garlic. Add parsley after you turn the heat off. Fluff the cooked couscous with a fork. Add the shrimp to the couscous and serve. Garnish with fresh herbs. My mouth is watering simply by reading the NAME of this recipe!! I will be making it on an evening when my husband is at work later – perhaps this Friday! 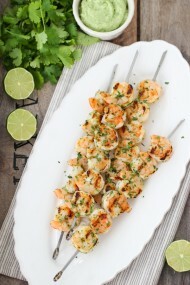 Looks like a delicious, easy summer meal- i’m excited to try it out! Do you think it would work just the same if i used quinoa instead of couscous? This looks so good and satisfying! I want the whole thing! 🙂 PInning! Congratulations on starting a blog, Valya. That’s wonderful! No, it’s not spicy at all, Olga. what do you eat Seared Shrimp and Summer Couscous with? I usually serve it by itself, or with a simple salad. 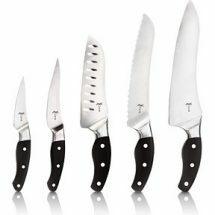 Thank you for the recipes you have posted on your website and for answering my question. can you please translate the word couscous to the Russian language? Sorry, I have no idea what it is in Russian. thank you for writing me back. Do not worry about of how you answered my question because I will not be mad at you. We had this for dinner last night and it was delicious! Even skeptical Fiance approved 😉 I added chopped cilantro instead of parsley, it was perfect! 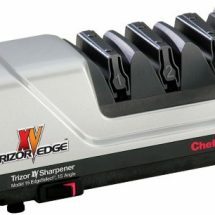 Awesome, Chelsea! Thanks for taking the time to let me know. Made this tonight and it was so good! I forgot the parsley and green onion, though. Next time I’ll remember but, again, it was so good even without it. My daughter ate it all and asked for seconds. It’s definitely a keeper. I’m thrilled that you enjoyed it, Rachel. Thanks for taking the time to write. 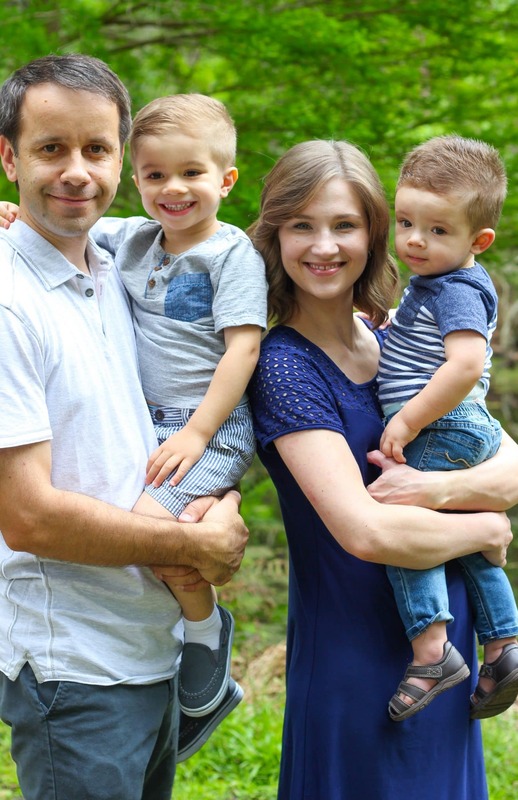 Very happy to hear the news.Slava Bogy.I am pregnant.I have two kids.The pregnancys are hard for me. But not is bad as yours.My first one was the hardest. But every day I pray to give me streath.God is Great to give such a joy to be women. He is allways with us. Hi Olga, love trying your recipes from your blog! 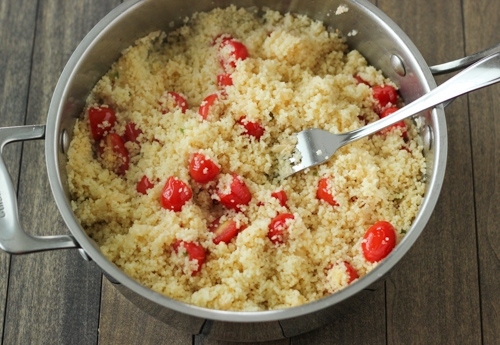 What type of couscous did you use for this recipe? There are a few different kinds. There is pearled, Mediterranean, Moroccan. Some are smaller grain, some bigger. Which kind is best? Thanks! The kind I buy is usually called “Original Plain” couscous. I would say it’s medium sized. It’s definitely not Israeli, which is bigger in size. Hi Olga. Thank you for sharing your recipes. 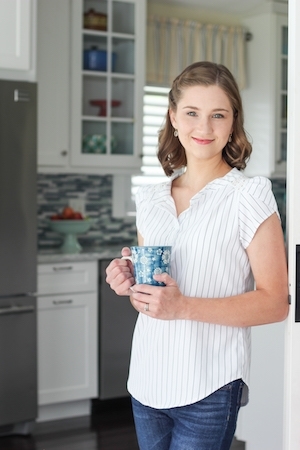 It is always a big help when choosing what to make for breakfast, lunch, dinner or just a dessert. 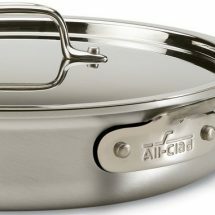 I am looking to buy a cookware set preferably stainless steel, no teflon coating. 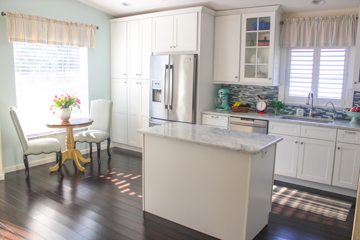 What do you use on your kitchen? 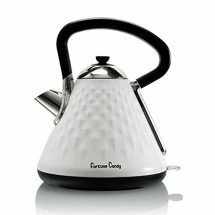 Which pots and pans would you recommend? Thank you so much for such a sweet comment, Yuliya. I am glad you are enjoying the website. You are and look an amazing person in every sense: cook, family. I follow your recipes from my home town: Querétaro, México! Thank you, Marite! Welcome to the site:).